Laser Show Safety allows the exposure safety of a wide range of laser show effects to be checked against safe exposure limits, helping to reduce the chance of harm occurring as a result of excessive exposure to beams too strong to enter the eye. Users can specify laser output powers from 100mW through to 50W, over a range of different beam characteristics, including different wavelength laser outputs (colours). 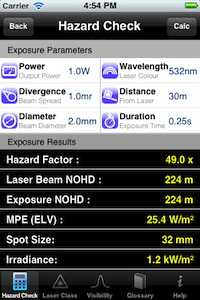 Specify the distance the laser will be projecting over, and the exposure duration from a range of effects, and the laser hazard checker will calculate the exposure and any hazard posed at the specified distance. If the distance is too short, the calculator will tell you at what distance exposure becomes safe. The divergence and power of the beam can be altered to establish the optimum settings to help ensure the safe viewing of laser effects against the MPE (Maximum Permissible Exposure) limits. 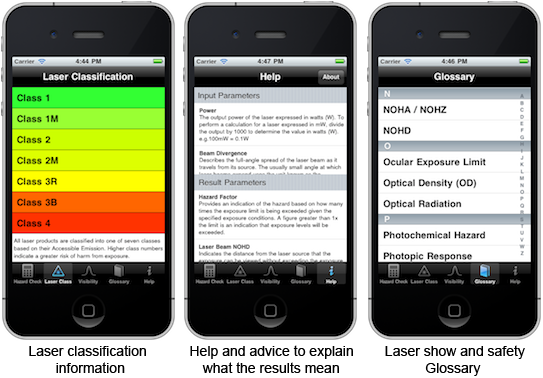 In addition to the useful Laser Hazard Checker functionality the App comes complete with a range of reference tools, providing information on laser class, a useful laser show and safety documentation glossary, as well as an interactive wavelength visibility tool that shows you the colour of any visible wavelength, along with information on its apparent brightness under bright, and low light conditions. Laser Show Safety is an indispensable tool for laser operator and safety professional alike to help create laser effects and shows safe for direct viewing. The App works worldwide, with IEC Standard and ANSI preference options. Direct exposure to laser light can be harmful to eyesight and normally care should be taken to avoid doing so, especially if the user has little experience in assessing the risk. 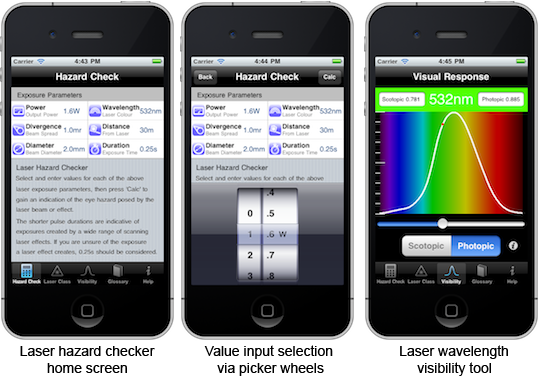 Laser Show Safety App is provided as tool to aid those competent in assessing laser exposure risk, and should be used alongside other assessment methodologies, not as a substitute.